There's just something about high wind and poor weather conditions while playing at Cleveland Browns Stadium that make Browns kickers and punters have performances that defy logic. Last year it was Phil Dawson kicking two field goals, including one of 49 yards, against the Buffalo Bills in blizzard-like conditions that included a wind that howled steadily at 32 miles per hour and gusted occasionally at much higher speeds than that..
"That was the greatest kick I've ever seen," Browns special teams coordinator Ted Daisher said afterward of the 49-yarder. He may be saying the same thing now about punter Dave Zastudil, who is the holder for Dawson. 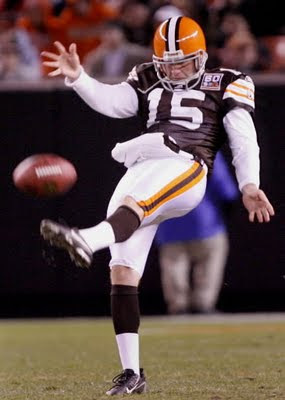 In Sunday night's 10-6 loss to the Steelers, Zastuidil averaged exactly 53 yards on five punts, believed to be the sixth-highest average in Browns history. Zadstudil's previous best effort with the Browns was a 45-yard average last year at Baltimore against his former team, the Ravens. His top performance overall came in the third game of his rookie season with Baltimore in 2002 when he averaged 52.5 yards in a home contest against the Denver Broncos. "Stats-wise, that was the best game I ever had," Zastudil said Monday as the Browns tried to put the loss behind them and get ready for next Sunday's contest against the Ravens. "If someone had told me before the game that I would do what I did, I wouldn't have believed them because of that wind. I didn't think it was possible. I surprised myself. There was definitely someone looking out for me." Maybe Ryan Pontbriand was his guardian angel. "His snaps, as usual, were very accurate, right there where they needed to be," Zastudil said. He didn't have to go reaching for the ball and disrupting his rhythm. As you might expect, Zastudil was really worried about the conditions before the game. "Depending on whether the wind was really blowing or not, I was kicking a 10-yarder, then a 40-yarder and then a 15-yarder," he said. "If you kicked it into the teeth of the wind, it wasn't going anywhere, no matter what you did. "For whatever reason, every time we were kicking during the game, the wind seemed to slow down for a moment, so we hurried up and snapped the ball to get the punt off before it picked up again." Zastudil said there's no secret to punting well in wind like that, but there are some general guidelines he follows. "I move up a couple steps so the snap gets to me quicker and has less time to be affected by the wind," he said. "You hold onto the ball a little longer and keep the nose down. You can't try to over-kick it. You just try to hit a solid ball." And Zastudil did exactly that again and again on Sunday in what he called one of three most difficult conditions he's ever kicked in, along with the Buffalo game and another contest last year at Cincinnati when it was also extremely windy. All this from a player who was bothered throughout 2007 by a sternum problem and went into this year with Daisher saying the Browns needed him to do better. It's what the club said to Dawson, ironically, heading into 2007 after he struggled down the stretch in '06. "I feel pretty good now," he said. "I feel strong." Zastudil's effort was the best by a Brown in 30 years. The five averages ahead of him, in order, belong to Johnny Evans (58.0 against the Seattle Seahawks in 1978), Sam Baker (56.5 against the St. Louis Cardinals in 1960), Horace Gillom (54.75 against the New York Giants in 1954), Gary Collins (54.33 against the Dallas Cowboys in 1965) and Dave Mays (54.0 against the Denver Broncos in 1976). But while all are obviously noteworthy, only the performances by Gillom (four attempts) and Collins (six) were with a lot of attempts. For instance, Evans kicked just once that day, Baker two times and Mays once. So by having five attempts -- and by doing it against a wind tunnel -- Zastudil's feat gains in its legitimacy and uniqueness. In addition, in 10 punts this year, he is averaging 46.8 yards, which would be, by far, the best average of his career if it holds up. In six previous seasons, his tops was 44.0 in 2006, his first year with the Browns after signing as a free agent.